Chris thought he has died and gone to heaven when I made these. I made them last weekend, baked one up to try it and froze the rest for a quick dinner. Since then, Chris has asked me approx. 4 times when we are going to have them. Think Jamaican Pattie, but no spice. Next time though, I’d definitely spice it up. I’m thinking cayenne, or maybe samosa-type seasoning? The original recipe called for raisins (in the place of peas), but this didn’t really appeal to me to I made a substitution. I feel like you could put anything in these, use your imagination! Make them, freeze them and then bake them and serve with a salad for a quick dinner. Use fun dipping sauces! A note about smoked paprika: I wasn’t able to find this, I used Spanish paprika that I thought smelled stronger than regular. It didn’t seem to add too much flavor, though they were still good. creases and then cut each sheet into 4 squares. 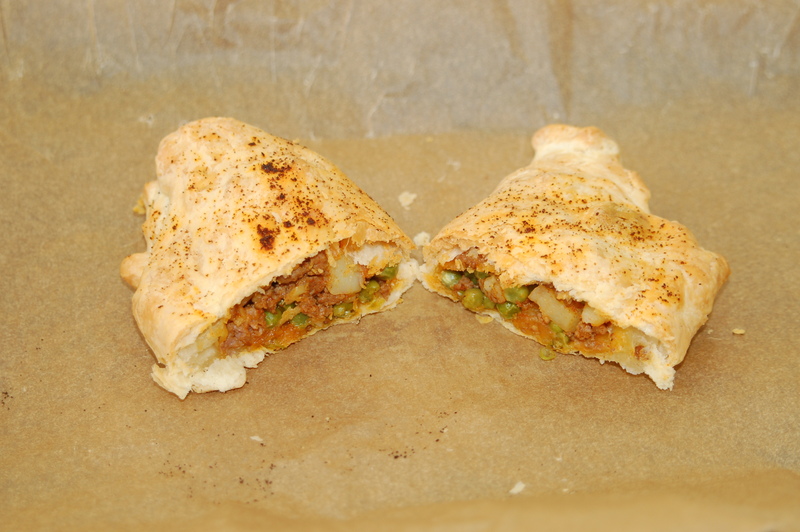 Please 1/3 cup beef mixture into the center of each pastry square and brush the edges lightly with water. Fold over the pastry, making a triangle and pinch the edges shut. Sprinkle with paprika. (This is the stage that I froze them at by placing them in a large plastic container lined with wax paper.) Transfer to a parchment lined baking sheet and bake until the pastry is golden and puffed, 20 to 25 minutes. Let cool 10 minutes before serving.